The complete cycle consists of 50 indexes. Each Cycle machines in most cases a single tooth, several for small tooth sizes. 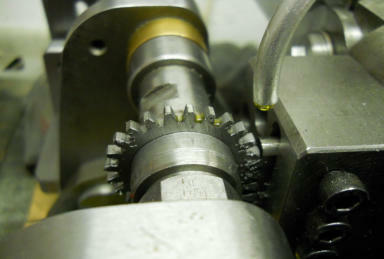 The cycle begins with the rack-cutter starting at the ‘home’ position and is engaged with the gear blank at the required depth of cut. A rotation rack is also fully engaged with the rotation gear. A ‘lock’ mechanism is engaged to prevent the arbor assembly moving outwards. After each return stroke of the rack cutter both racks (cutter & rotation) move vertically by a small increment and in so doing the rotation rack meshed with the rotation gear rotates causes the gear blank on the arbor to rotate a small increment. The amount of rotation is in direct relationship to the vertical movement of the racks. This process is repeated 25 times. 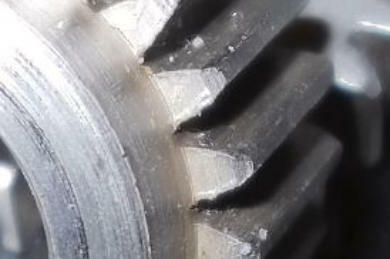 The lock mechanism disengages to allow movement of the arbor assembly which now moves outward to allow the racks to be clear of the associated gears. The racks now both descend to the ‘home’ position which is fixed by a height limiter, this ensures the start of cutting in a cycle is always consistent. Once fully lowered, the gear blank and rotation gear re-engage to their racks ready to start a new cutting cycle. Clip showing the machine in operation cutting a new gear. To return from YouTube press the Go Back one Page icon on the browser page. several for small tooth sizes.